Keynote speaking in the Philippines summarizes the core message or the main underlying theme of the entire event. You need a keynote speaker who can customize a speech to bring the atmosphere that you want for your audience during those seminar hours they’re in. It is all about setting the right tone, mindset, and expectations – either what kind of information they will hear from other speakers, why is the event conducted in the first place and what they should expect during and after the program. 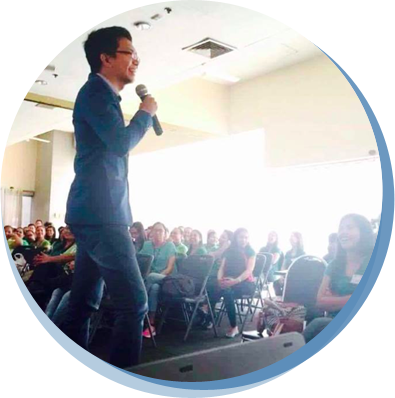 Venchito Tampon is a corporate trainer in the Philippines who is frequently invited by companies, organizations, and schools to be a keynote speaker, resource speaker or a workshop facilitator for their events. With an entrepreneurial background, Venchito started his business at the age 21. After two years, SharpRocket has grown from 0 to P10,000,000 in annual revenue with only 15 employees under him. Venchito Tampon is an Emotional Intelligence Practitioner certified by GENOS International. He is also a Certified Facilitator of YOUnique DISC Program by a top-notch speaker, Jayson Lo. If you want a keynote speaker, who can speak from the heart that touches lives of your audience and can create a solid atmosphere to enjoy and engage with the program of your event. If you're interested in contacting him for a keynote speech in your organization in the Philippines, you can use the contact form below. What are you trying to reach?